A Pasture Painting made by For the Love of Bees in collaboration with Newmarket school, who created the maze design. New schools are also helping with upkeep, including Parnell Primary. This is part of turning Highwic into a Regenerative Park that is safe for pollinators, helpful microbes and humans. In the mission to turn Auckland into the safest city in the world for bees and become an Organic City, For the Love of Bees has initiated a collaboration to transform Highwic into the very first Regenerative Park in the inner city. This is a transformation you can be a part of! The full list of collaborators on this very special project are Highwic, Newmarket Primary School, Auckland Council, Enviroschools, Parnell Rotary Club, The Compost Collective, Tree Croppers Association, Beezthingz, Sustainable Schools, Wecompost, Hot Grass, Weedtechnics, Parnell Primary and Heritage New Zealand. Initial funding has been provided by the Waitemata Local Board and Parnell Rotary. New infrastructures include teaching hives looked after by Walter Dendl and a community composting teaching hub, run by The Compost Collective. The project focuses on achieving our four criteria of a Regenerative Park. The development of a Biological Pollinator Sanctuary. This involves going spray free and developing billions of flowers to provide foraging habitat all year round for pollinators. Increasing carbon sequestration capacity. This involves the elimination of synthetic fertilisers and herbicides, an adjustment in lawn cutting practise, and the introduction of plants with deep living roots systems. Introducing closed loop fertility. This means utilising homemade fertility by composting all green and organic material onsite. Such material is welcomed from neighbours too. What's the relation between bees and carbon you might ask. Well, there is no creature that climate change does not touch. In the case of bees, excess carbon dioxide in the air alters pollinators food sources in a way that threatens their vitality and immunity. Studies have found that increased CO2 speeds up photosynthesis, enabling the plant’s starchier parts to grow faster and bigger. Plants consequently pack in more carbohydrates like glucose, at the expense of important nutrients and protein. This diminishing nutritional quality is happening to our food too! This means it is crucial that we supply more food for pollinators in our parks to ensure they can consume adequate amounts of protein. It also serves as yet another another reason to pursue new carbon sequestration methods. You can read more here. Highwic is the starting point within a wider For the Love of Bees project called ‘Regenerative Parks’ This project will enable a transformation of the bulk of our inner city green spaces into safe havens for bees. Newmarket school lay down compost in the making of the Pasture Painting they designed themselves. Their work has already earned them a Green-Gold award! As part of this project, Highwic is becoming a space to test various sustainable vegetation management strategies that put biology first. In doing so, it will refine a programme that For the Love of Bees have developed, which may be scaled up to more parks throughout the city. Some of the methods in that programme include Weedtechnics and Hot Grass, which is the distributor for Australasia of the RootWave Pro electrothermal weeder - due for commercial release in 2018. This groundbreaking technology uses electricity to control weeds with power from a generator or mains that uses a fraction of the fuel required for other thermal weed control methods. The prototype demonstration model of the RootWave Pro has been tested at Highwic already with excellent results, and was able to clear a large area of weeds in lawn completely without any chemical residues. Highwic has become a Community Composting Hub as a part of becoming a Regenerative Park. It has two bins from NZ Box that have 1.5 cubic metres of capacity each. One bin has the capacity to receive the weekly food waste from a minimum of 120 households. The bins are locally made, rat proof, smell proof (with good management), easy to turn from one to another (as any side comes away), interlockable, and can get very hot so can actually take meat and fish. They also last for 15 years, are easily movable and look beautiful! What more could we ask for? 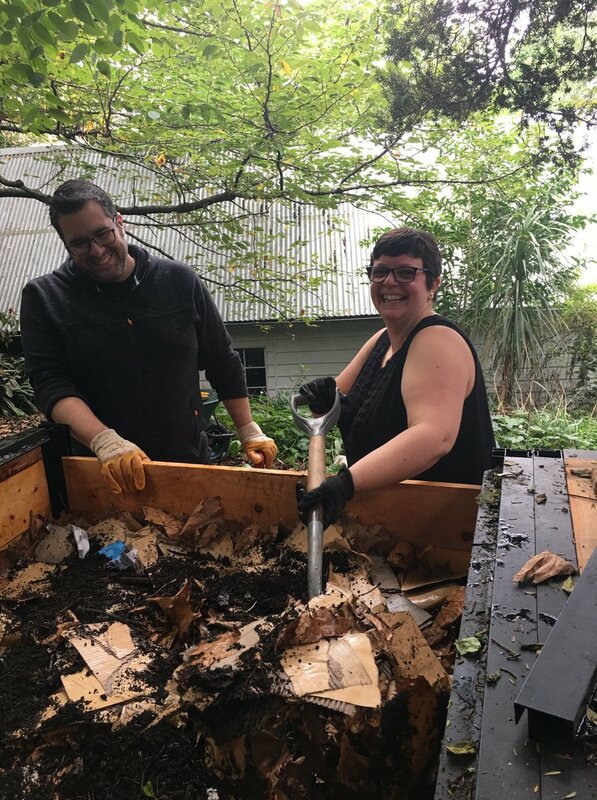 It’s our vision to set up community composting sites all over the city, where people can fall in love with compost. Get in touch if you want to help make this happen. We have a working team including Dignan Street Community Garden, Kelmarna City Farm and Organic Community Garden, NZ Box and Go Well Consultancy.